Including: 1 indoor introductory rowing session, 1 boathouse safety/induction session, and 6 sessions on the river, all coached and coxed by experienced members of the club. Courses take place on the Isis river in Oxford (just south of the city centre), and all are welcome to participate. You will be a member of the club for the duration of the course, including social events and access to the club facebook group (used for social discussions), and will have the option to join the club on a longer term basis after your course finishes. 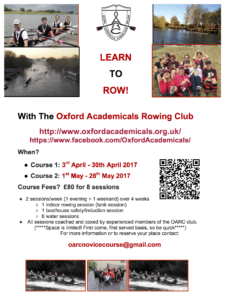 We will also be holding a social evening (dinner and drinks) for all Learn To Row course “graduates” after both courses have finished, which is always an enjoyable occasion! Please email oarcnovicecourse[at]gmail.com for more information on exact dates/times or to reserve a place. Places are first come first served and will be confirmed after payment has been received. We hope to see you on one of this year’s courses! Hello. 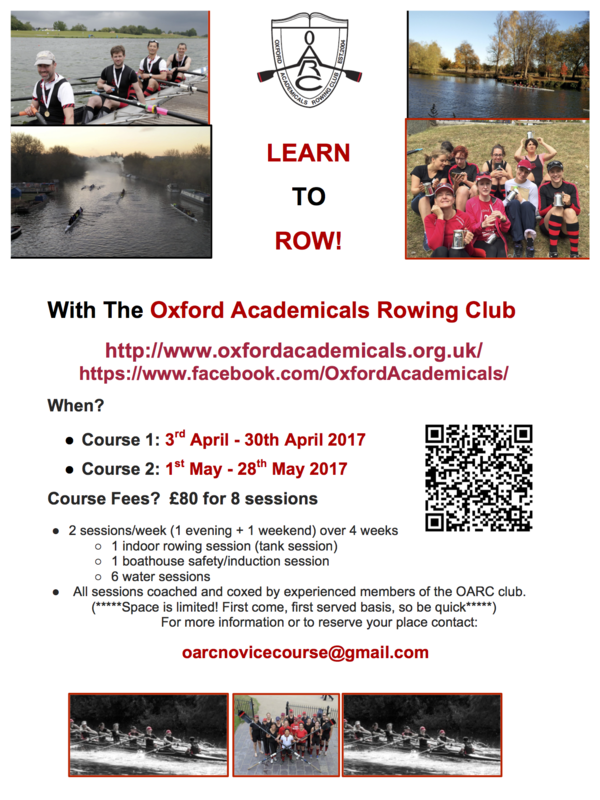 Do you do rowing courses in July to October ? I would like the opportunity to learn to row after work mid week. The closest I get to this at the moment is the rowing machine in the gym and as I am currently working in Oxford what better place to have a go and opportunity?